Do you remember the ending to that great Indigenous film, Samson & Delilah? The damaged couple set up home in the middle of nowhere – a remote outstation where they could live off the country and recover their moral and physical health. Amazingly, NT Indigenous politician Alison Anderson declared that solution just a downer. But then the former ALP Aboriginal Affairs and Arts Minister had instituted the '20 Townships' policy by that government – intending to drive people off their remote lands into the towns through a series of economic disincentives. She did not want the alternative so powerfully advocated, despite the fact that much the greatest remote art emerges from those outstations. And that's the background to a new book called People on Country being launched around the country during October. Over the past four decades, Aboriginal people living in remote and regional Australia have been empowered by land rights and native title laws to claim back large tracts of their ancestral lands. Today the Indigenous estate covers over 20 per cent of the continent and includes areas of globally significant biodiversity and cultural value, many now declared as Indigenous Protected Areas in the National Reserve System. But none of the Indigenous estate is in its pre-colonial condition and it faces many practical problems if it is to overcome a myriad of environmental threats. 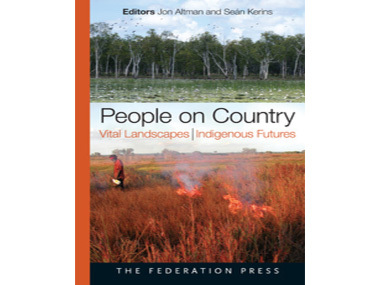 People on Country: Vital Landscapes, Indigenous Futures draws on a diversity of perspectives to document a significant social and environmental movement that is quietly gathering momentum across this vast Indigenous estate. This series of essays, drawn from a pioneering collaboration between university researchers and Indigenous land owners – many of whom, like the Marikas and Munyarryuns of Yirrkala are also artists - tells a little-known story about Aboriginal people who are living on, working on and caring for the lands and seas that they own and manage. The ongoing struggles by Indigenous people to conserve and rehabilitate the outstanding natural and cultural values of their ancestral lands deserve wide recognition and acclaim. This book seeks to reposition Indigenous people and their caring for country activities from the margins to the very centre of the growing national conversation on issues such as climate change, biodiversity loss and resource depletion. It challenges the Australian public, policy community and politicians to re-imagine the role that the Caring for Country movement, deploying a two-way mix of western scientific and Indigenous ecological knowledge systems and techniques, must play in the proper environmental management of Australia in the 21st century. At the Sydney launch, the dreams were also brought down South in that we discovered that NSW Aborigines actually pioneered Indigenous Protected Areas – and now have 9 tiny patches, compared to the great swathes across the North. But an understanding of the high value that Aborigines place on Country can be discovered at places like Lake Mungo, Mutawintji, Mt Grenfell, Jervis Bay, Gulaga & Biamaga, and Arakwal National Park near Byron Bay. Nowhere was life meant to be easy, though. It took 7 years of delicate negotiation for the Djelk IPA to be established in 2009 covering 10,000 sq kms of land south of Maningrida and the same amount of the Arafura Sea. 102 clans were involved in the negotiations, covering 7 different language groups. “Making the future strong for our children”, was the catch-cry; “but how can we do that without strong outstations providing jobs from land and sea management, but all too often lacking educational and health services?” . “It seems the government cannot listen to this story”, complain the Djelk Rangers. Indeed, the last NT Government clamped shut its ears and introduced something aspirationally called 'Territory Growth Towns' which were to get all the money that wouldn't now be available to support outstations. Ironically, the person now called Minister for Aboriginal Advancement in the newly elected NT Government was behind that project. Now, it seems, Alison Anderson may have changed her tune. For The Australian newspaper reported recently: “The newly formed government contains, for the first time, a sizeable bloc of indigenous parliamentarians from traditional communities, elected on a platform of strengthening remote communities and outstations, the places that make up the heartland of the desert painting movement”. Was this wishful thinking, or judicious policy-making, taking advantage of the well-researched efforts of academics like Jon Altman – now with two books on the subject, 'Culture Crisis' and 'People on Country'? Associated in the launch of the book is the Karrkad-Kanjdji Trust which looks like an excellent way to get involved in supporting these remote land-managers to maintain their connections to a patch of Australia half the size of Switzerland where both of the great Western Arnhem artists, John Mawurndjul and Lofty Bardayal have lived, created and cared for their country.